Do you have earthquake insurance? Probably not. In fact, in California—which the rest of the US thinks of as “earthquake country”—only 12% of homeowners have coverage, according to Bloomberg Business. Since major earthquakes are rare and unpredictable, most homeowners don’t think insurance is worth the cost. But understanding the benefits of earthquake insurance and preparation could make all the difference in keeping your home and family safe if the “big one” ever arrives. 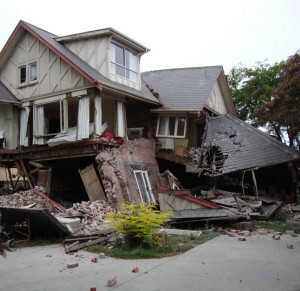 Standard homeowners or renters insurance does not cover earthquake damage, as NerdWallet explains. However, California state law requires that property insurers offer earthquake insurance as an option if you already have property insurance. Before deciding whether to purchase earthquake insurance in California, first consider how high the risk is for your property. The California Emergency Management Agency website MyHazards offers a free risk assessment for natural hazards in your area by city or street address. Of course, you will have to consider the added expense of earthquake insurance, as well as the deductible. Most earthquake coverage includes a 10-15% deductible, which would be quite high if your entire house was destroyed. That percentage is far less than a total loss, however, which is possible if a major earthquake hits and your home is not insured. Deciding to invest in earthquake coverage is a personal choice (at least until the government makes it mandatory). But preparing your home and family for an earthquake is much less expensive, and could be far more useful—even life-saving—in the event of a shake-up. There are two key ways to prepare for an earthquake: make sure your family knows what to do when a tremor hits, and retrofit your home to withstand seismic activity. Pick safe places in each room of your home, preferably under a piece of furniture or against an interior wall away from windows, bookcases or tall furniture that could fall on you. 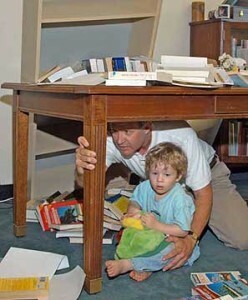 After an earthquake, expect and prepare for potential aftershocks, and get everyone outside if your home is unsafe. Attach your home’s mudsill—the wood that sits atop the foundation—to the foundation with anchor bolts, if the two are not currently connected. Reinforce cripple walls (short wood stud walls that enclose the crawl space between a home’s concrete foundation and the first floor) with plywood. Check for structural weakness, such as unreinforced brick or stone masonry, or faulty materials in the home’s concrete foundation and wood framing. Additional information on preparing your home for an earthquake is available at this link [pdf]. While some of these techniques can be performed yourself with basic carpentry skills, a building contractor can provide invaluable help and may notice additional areas that need retrofitting. Are you considering seismic retrofits for your home? The building experts at Cal-Best Construction can help! Contact us online or call 714.630.1180 to speak with a restoration specialist at Cal-Best Construction today. We look forward to assisting you!